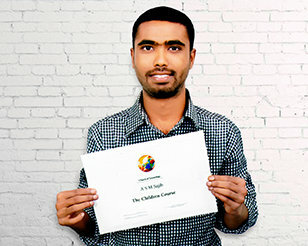 Entrepreneur and anti-corruption activist Asaduzzaman Sajib shows off the final one of his 19 certificates, this one for The Children Course. A knowledge thirsty and determined twenty-six-year-old found Volunteer Minister online courses in 2012, and the rest is history. Asaduzzaman Sajib’s neighbor was a heroin addict. That is, until Sajib took the Volunteer Minister (VM) course, Answers to Drugs. Sajib walked his neighbor step by step through the tools he had learned—the dangers of drug abuse and the long-term consequences—and inspired his neighbor to quit. “But how?” was the only question. “I showed him,” says Sajib. Many “drug bombs” later—a vitamin formula designed to combat the effects of withdrawal—along with a series of powerful, simple procedures to help an addict pull his attention off his anguish and onto the world around him, and Sajib’s neighbor had lost the cravings. He was clean. “He told me that I saved his future,” says Sajib. As Bangladesh’s first-ever graduate of all 19 Volunteer Minister (VM) Tools for Life courses—and with results like that—Sajib has reason to be proud. Sajib, a 26-year-old entrepreneur and anti-corruption activist, says he was always a truth seeker. He describes growing up in one of the most underdeveloped areas of Bangladesh, the Kurigram District, with a thirst for a knowledge that transcended the academic, even while his parents forced his head back into textbooks. Though Sajib went on to earn a business degree in the United Kingdom, he returned to Bangladesh wanting to help his people and still lacking the true knowledge he needed to do so. Then, in 2012, he came upon the Scientology Volunteer Minister Courses online. He embarked on his first course, Tools for the Workplace. Then chose the next one, The Technology of Study. Then the next one, Ethics and the Conditions. When he learned that one can request an on-site Volunteer Minister seminar anywhere on Earth, he did so, and was told that a VM would visit from a neighboring country, as there were none yet in Bangladesh. “What do I have to do to be the first Volunteer Minister in Bangladesh?” was his immediate reply. The answer? Complete all the Tools for Life courses. The Dynamics of Existence was the course that changed him the most, Sajib says. It outlines life’s eight survival impulses, or dynamics—oneself, one’s family, one’s group, mankind, all living things, the physical universe, spirituality, and infinity or the supreme being—and how one uses an understanding of these to make decisions about the future. A Razão de Ser um Ministro Voluntário?